"Can you take this dent out?" asks the guitar's owner. My usual response is to explain that we're talking about a hole or place where there's something missing, and that we'll have to consider filling in the dent. But sometimes it actually is possible to remove a dent. If I work patiently and take enough time, I can sometimes coax the wood underneath the finish to swell back to its original thickness, provided that not too many wood fibers are crushed. Here's a perfect example of a job that went just right. The instrument in question is a Taylor guitar, model 714, with a cedar top. Cedar is the most easily damaged of the conventional guitar top woods, and this one took a nasty blow from a not-so-blunt object. It was in the soft grain between two hard grain lines, with no apparent break or crack in the finish. It's really hard to photograph this up close, without too much glare. That's why the color is so different in the long shot. I heated up my soldering iron, and began to "steam" the dent. I laid a small piece of water soaked paper towel over the spot, and gently pressed the tip of the hot iron directly over the dent. Immediately, I'd move the wet paper towel aside and look at the results. I'm VERY concerned and careful not to overheat and melt the finish! I continued wetting the paper towel, touching it with the iron to release water vapor (steam) and moving it aside to allow the finish to cool as it seemed necessary. I spent about a ten minutes with this process before I noticed any change at all. Here it isn't perfectly smooth and level, but it is raised considerably. You may also notice that the area nearby shows a little "washboard" effect as the added moisture caused the soft grain to swell. I was tempted to sand the surface level and polish it right away, but I waited because I knew that later the extra moisture would dissipate, and the area would shrink back just a teeny bit. If I had rubbed out right away, I'd have been left with a depression in the area when it dried thoroughly. If you look REALLY closely, you can see just a little deformation of the wood fibers under the finish. The finish shows no sign of a dent in reflected light. I can't overstate the need to be careful of the heat and moisture. Lots of old finishes will blush and turn white, blister or melt if they're overheated! This instrument has the most cooperative finish - a catalyzed polymer that will stand the heat of steaming. Things don't always work out this neatly, but it is usually productive to apply a little steam to a dent to allow the wood fibers to regain their most relaxed position. Then, a subsequent fill won't have to be as deep. I've never been able to predict the exact results. Sometimes it seems a shallow dent just won't swell up they way I expect. Here, a deep one went better than I predicted. As my friend, Brian Burns, always says, "If you're lucky enough you don't need skill!" I can go with that. Here's a more typical job. This ding is very deep. I was able to drop the depth gauge of my dial caliper into the dent and it read 0.011" deep. It actually looks even deeper than that, doesn't it? The finish is cracked at the edges of the wound, so steam could penetrate under the finish faster than the Taylor job on page one. I steamed for about ten minutes before I was certain that I could get no more swelling of the wood. 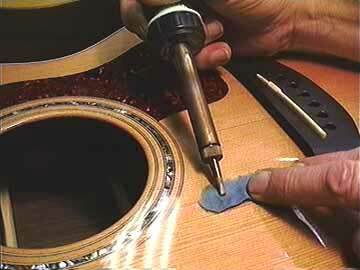 This is a Martin guitar with nitrocellulose lacquer finish which is much more sensitive to the heat and moisture. From here, I'll fill the dent with new lacquer and blend it to the surrounding surface. The advantage of steaming is that I need to build up far less depth of lacquer to fill the dent, so my final result will be a less noticeable repair.